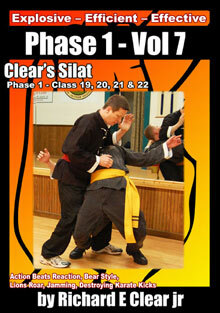 Standing Bear is one of the basic entries in Clear’s Silat Phase I that contains critical skills for more advanced training in the art. It is long power based movement that is most often seen in the orangutan movenment in the island arts. The first skill worked on and learned is how to use the power of gravity to drop an enormous amount of whole body power on your opponent. At more advanced levels it is easy to use the skills learned in this kind of fighting method to break an attackers arm. Most people will find the basic training method unusual both in look and application but after you have trained the basics actually apply this fighting method becomes easy. To practice Standing Bear start by holding your arms up over your head as high as you can and stand up on your tip toes. Then drop your feet flat to the floor and let your knees bend down a little as you drop one of your arms and let it swing in an arc so that it ascends back up without any delay. Gravity is the main source of power once you let the arm go. The energy from the drop is what makes it rise back up helping you get back to the first position standing on your tip toes with your hands over your head. Once you have practiced dropping your arms across the front of you then you can switch and drop your arm to the front while again letting the arm arc so that it rises back into the upper position over your head. Practice this with each hand and then practice stepping a bit while dropping the arms. Intercept the attack before they can reach you. Look carefully and consider what your physical coverage area should be. Anywhere that you can reasonably reach with one of your arms is within your target range. With a bit more practice you should be able to reach an incoming hit before an attacker can reach you due to your position and the extended reach from your arm position. A practical training note regarding position is that I have found most people will try to rectract their arms as or before they drop them. This decreases your target range, slows down your dropping hit and robs it of power because you are engaging more of your body and using gravity less to power the technique. Once you have practiced a bit more then you can use both the drop and the upward motion to strike while adding body power to the gravity of the movement. Your whole body steps and moves much like the heaving and swaying action of a real bear. Have fun and enjoy the training.